Check your tired stressed skin into rehab with the Monu Recovery Balm. The gentle formula of this balm works as immediate relief to soothe irritation and reduce inflammation to all skin types, especially sensitive or over worked skin. Used by professional therapists, Monu have perfected their unique beauty treatments using only the purest ingredients to deliver you beautiful products that care for your skin. Packed full of loving ingredients, this Monu Recovery Balm will hydrate dry, thirsty skin and leave it feeling refreshed, renewed and perfectly soft. This cream is suitable to calm environmental or elemental damage and invasive dermatological procedures. Directions of use: Apply in the morning and evening After cleansing and toning, apply a small amount to the face and neck using a gentle upward movement. Directions of use: Apply in the morning and evening After cleansing and toning, apply a small amount to the face and neck using a gentle upward movement. I recently tried this out and really was not disappointed with the results. My skin felt smooth and nourished and those little fine lines seemed to be finer. It absorbed well and left my skin feeling silky smooth. A little went a long way and the sample size I received lasted ages. It didn't clash with my moisturiser either. I used a little of this after cleansing and was amazed.you only need a small amount as a little goes a long way. After application all and i mean all my fine lines were reduced and skin looked a lot smoother. Another amazing thing was that it felt amazingly soft to the touch,like powder soft but also hydrated. I love this product and will definatly be buying the bigger size. Hi Diane. As a user, you're welcome to create an account and post a review of this product. Kind regards. 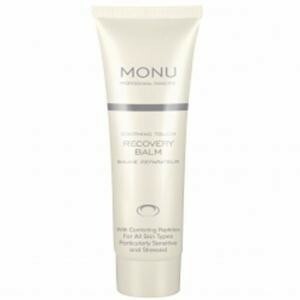 We stock the full range of Monu produst at SoTanned.co.uk - the range is truly fantastic: Recovery Balm is excllent, and I personnaly use it in conjunction with the Calming Cream which, having a slight green tint, visibly reduces redness while it calms the skin. Cannot recommend highly enough.